Energy-dispersive X-ray spectroscopic (EDS) tomography is a powerful three-dimensional (3D) imaging technique for characterizing the chemical composition and structure of nanomaterials. However, the accuracy and resolution are typically hampered by the limited number of tilt images that can be measured and the low signal-to-noise ratios (SNRs) of the energy-resolved tilt images. Various sophisticated reconstruction algorithms have been proposed for specific types of samples and imaging conditions, yet deciding on which algorithm to use for each new case remains a complex problem. 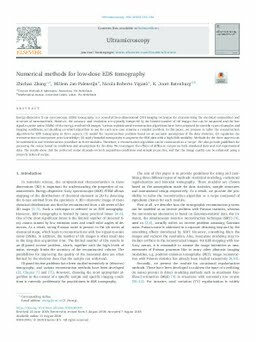 In this paper, we propose to tailor the reconstruction algorithm for EDS tomography in three aspects: (1) model the reconstruction problem based on an accurate assumption of the data statistics; (2) regularize the reconstruction to incorporate prior knowledge; (3) apply bimodal tomography to augment the EDS data with a high-SNR modality. Methods for the three aspects can be combined in one reconstruction procedure as three modules. Therefore, a reconstruction algorithm can be constructed as a ‘recipe’. We also provide guidelines for preparing the recipe based on conditions and assumptions for the data. We investigate the effects of different recipes on both simulated data and real experimental data. The results show that the preferred recipe depends on both acquisition conditions and sample properties, and that the image quality can be enhanced using a properly tailored recipe.